Dancing With The Stars Wins One 2011 Emmy Award!! Last night, the 2011 Creative Arts Emmy Awards took place at the Nokia Theatre in Hollywood, CA. Dancing With The Stars was nominated in 7 catagories which included Outstanding Reality Series, Outstanding Reality Host-Tom Bergeron, Outstanding Choreography-Mark Ballas, Outstanding Hairstyling For A Single-Camera Series, Outstanding Lighting, Outstanding Makeup For A Multi-Camera Series Or Special, and Outstanding Technical Direction, Camerawork, Video Control For A Series. From the 7 nominations, the show picked up one Emmy for “Hairstyling For A Multi-Camera Series Or Special”. You can view all the 2011 Emmy Award Winners at TVLine and Emmy.com. 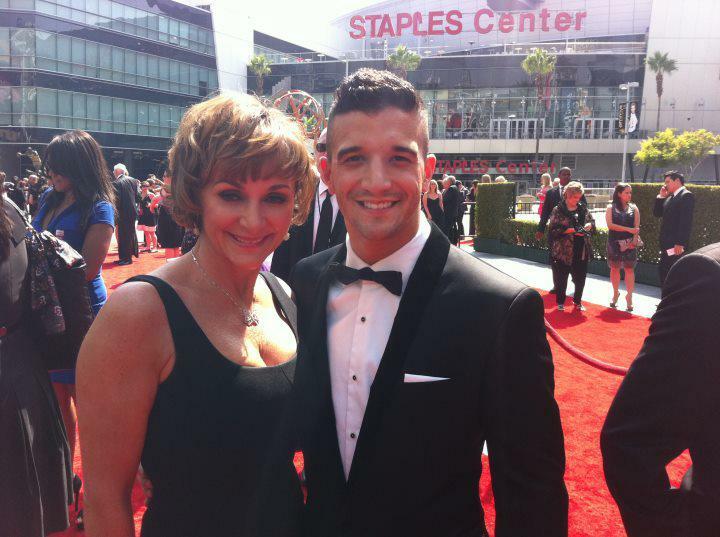 As some of you know already from Twitter, Mark attended the awards with his Mom Shirley. Here they are gracing the Red Carpet. Shirley wore a killer black dress and Mark looked dashing as well in a black and white tux sporting a “Situation” type hairstyle. Another Red carpet favorite last night was Season 13 Dancing With The Stars contestant, Chaz Bono and his girlfriend, Jennifer Elia. His documentary “Becoming Chaz” was nominated for 3 Emmy’s. According to his twitter it lost to “Gettysburg”. Twenty-five other awards will be handed out at the LIVE Primetime Emmy Awards telecast on Fox next Sunday, September 18 (5-8 p.m. PT, 8-11 p.m. ET). Be sure to tune in if interested! !